What's a 100th birthday party without a few, once-in-a-century, souvenirs and gifts? Here's what we created and produced for this event. 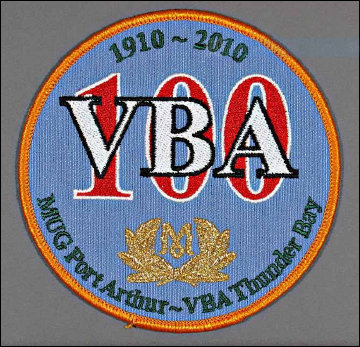 We needed a centennial crest and this was the result. 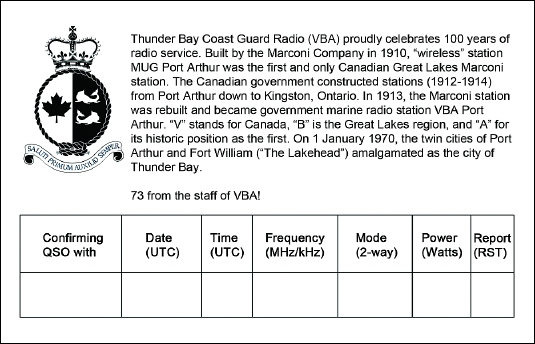 It incorporates the blue waters of the Great Lakes; the red and white of the Canadian flag; the gold Marconi wireless officer's cap badge, and the green of terra firma. It was used on many items such as these "peel & stick" stickers and fridge magnets. 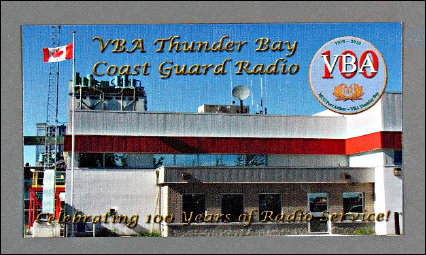 Left are the custom Amateur Radio QSL and VBA Thunder Bay centennial postcards, depicting the front of the MCTS Centre with the appropriate overlays on the front and brief history of the station with contact information on the back. The tower mast and various roof antennas are used for direct local communications and bypass the Rabbit Mountain remote site (10 km inland). 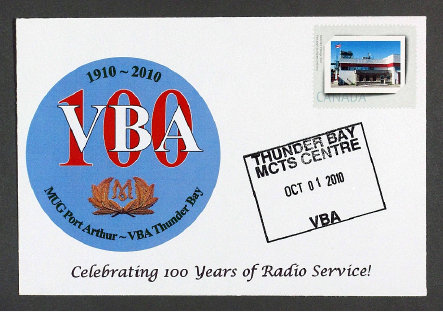 Many radio hobbyists are also philatelists (stamp collectors) and Canada Post lets you create custom "forever" real postage stamps. 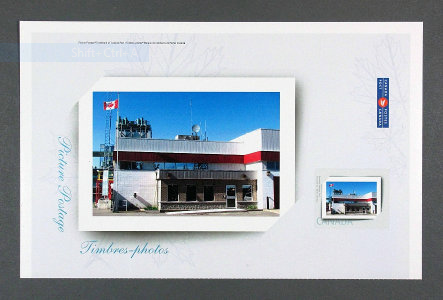 You get a sheet stamps along with an enlargement of the actual stamp design. Using 4" x 6" envelopes, the custom peel & stick MUG/VBA crests, and customs postage stamps, plus the station certification stamp, special VBA 100 First Day Covers (FDC) were created. 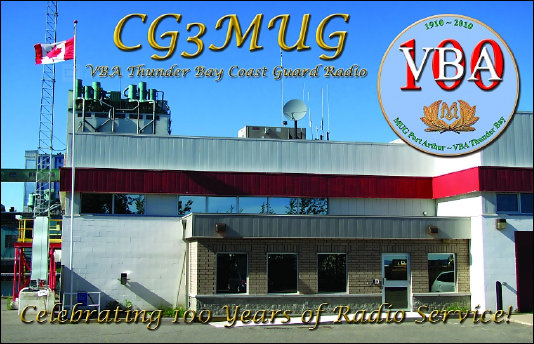 A very special one-of-a-kind item for radio enthusiasts who also collect these types of topical radio stamps and covers. 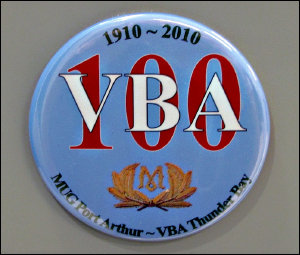 For those who collect fridge magnets, two variations were created: a rectangular one from the VBA 100 postcard (resized to 2" x 3-1/2"), and a round badge type using the crest design (resized to 2-1/4"). 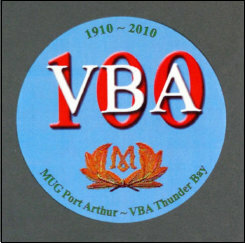 Sew on patches and coffee mugs complete the collection of centennial souvenirs. 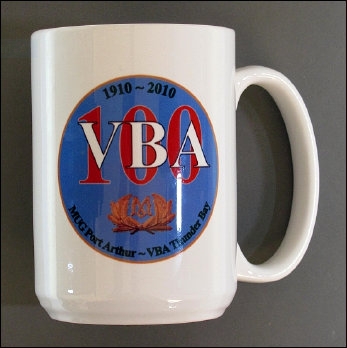 Some clothing items with the MUG/VBA crest were ordered by the staff, and these included t-shirts, fleece jackets and hoodies We didn't order baseball caps because they were too pricey for small quantities, and the crest didn't fit unless it was greatly reduced and this caused problems with the text being too small to read. 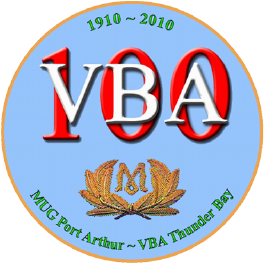 None of us on the VBA 100 team had any experience in graphic design, but the crest came about during an afternoon of doodling and emailing ideas back and forth, and then everything else just fell into place. 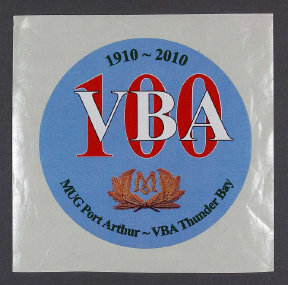 There wasn't any real artwork needed except for the Marconi cap badge which was obtained from a photograph and digitally cut and pasted into the crest design. "Liberty does not exist in the absence of morality." Personal web site. Not affiliated with any agency. Copyright © 2000-2019 R. C. Mazur, VA3ROM.